The All Progressives Grand Alliance (APGA) has suspended the newly-elected 'Speaker' of the Anambra State House of Assembly, Ike Uzoezie, and two other principal officers. 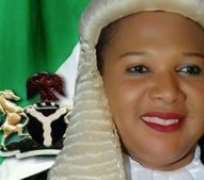 They are the Deputy Speaker, Hartford Oseke and the Majority Leader, Maduforom Okoye, for their perceived roles in the removal of the erstwhile Speaker Rita Maduagwu. The state chairman of the party, Chief Nobert Obi, who spoke with reporters at the party's secretariat in Awka, lamented the role played by the trio who are respected party faithful in the whole saga. Obi, who acknowledged that the impeachment crisis was ill- timed, especially now that the cohesion of the party was in shambles as a result of the misunderstanding arising from the recent party primaries, expressed disappointment in the conduct of the suspended members, saying the party has set up disciplinary committee to investigate their grievances in a bid to restore peace in the House. The party also enjoined members to explore the party's provision to ventilate their grievances, saying the party would ensure peace is returned to the state House of Assembly. Obi, however, maintained that APGA was not the only party in crisis but that all hands must be on deck to ensure internal democracy and fair-play in the party.